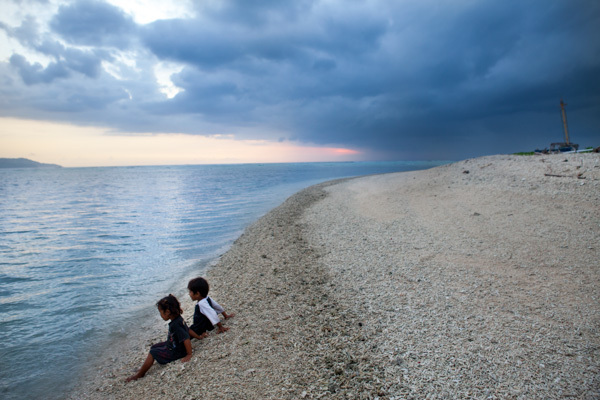 Two small children sit at the water's edge on Gili Air as a thunderstorm gathers on the horizon. 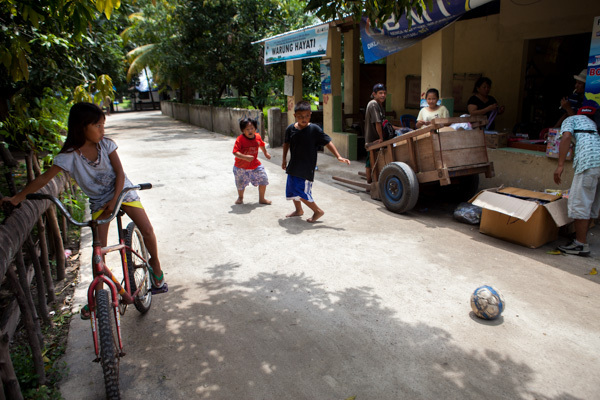 The tiny Indonesian island has no cars, motorcycles or dogs and children seem to have a tremendous amount of freedom. Imagine three tiny islands with no cars, motorcycles or dogs, surrounded by beautiful clear blue waters and white sand beaches. The occasional clip-clopping of horse hooves blends harmoniously with the rhythmic sounds of the ocean and the occasionally mewling of a cat. What you’d have imagined are the Gili Islands, an archipelago of three tiny islands off the coast of Lombok, Indonesia. “Gili” which means “tiny island” in Sasak, is an accurate adjective for these islands which together are less than 10 square miles. I spent some time on Gili Air and fell in love with its otherworldly beauty, its quiet streets and small fishing community. Gili Air is the second smallest of the islands and has a population of around 1800 local residents. While it is a popular destination for tourists who mostly stay in small bungalows on the beachy perimeter of the island, when one walks the interior or wakes up early and heads to the harbor, one still gets a sense of the real community and the rhythms of its anachronistic lifestyle. 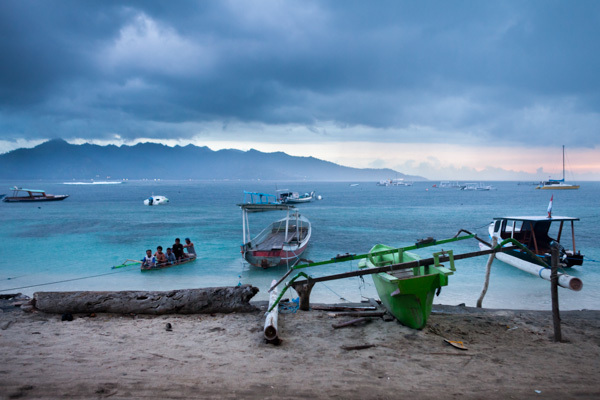 Below are some of the vignettes I encountered during my magical time on Gili Air. A little girl laughs amidst her family members on the beach just before sunset. 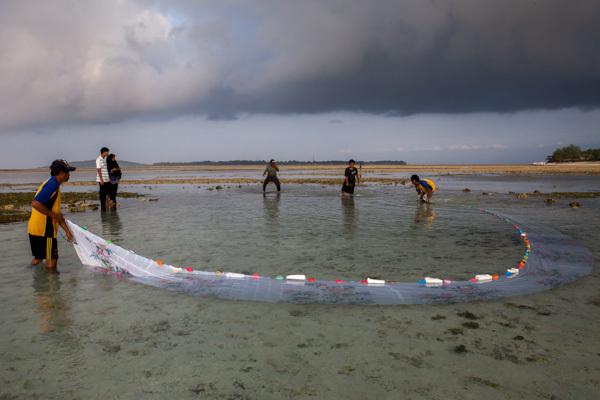 The fishing nets below her are laid out on the beach because her grandfather was repairing some tears in them. A group hurries back to land just as a rainstorm begins to douse the island. The rainy season, which runs from November to April, brings afternoon rainstorms and lush vegetation to the island. 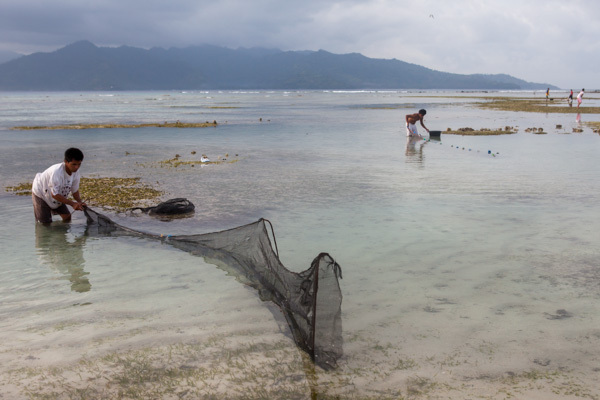 Fishermen prepare their nets for catching 'finger fish'--a tiny silver fish cooked whole with eggs and flour. Fishermen coral the tiny 'finger fish' into their waiting net at lowtide. A fisherman shows off an octopus that unexpectedly became caught in his net. The octopus is boiled to soften it, then put into soups. 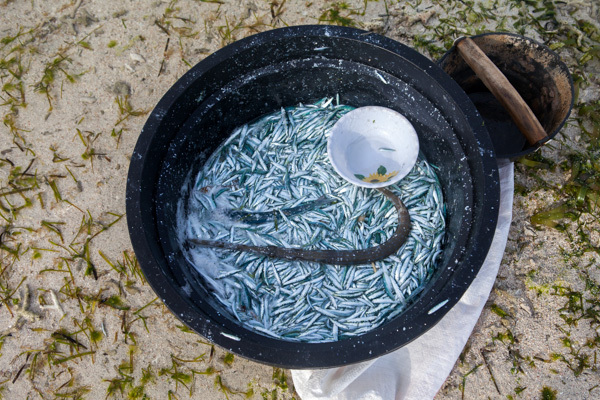 A bucket holds 'finger fish' and a barracuda that too got caught in the fishermen's net. 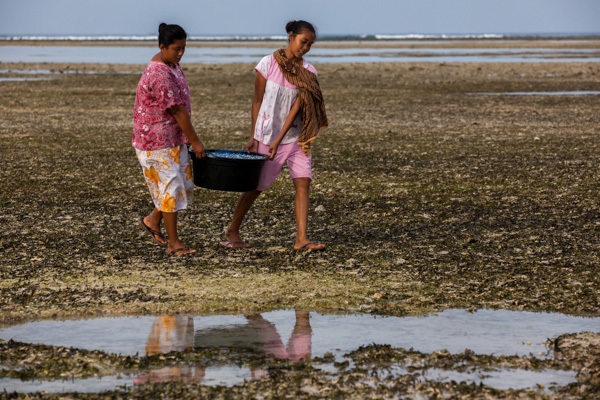 Women carry a full bucket of 'finger fish' home. 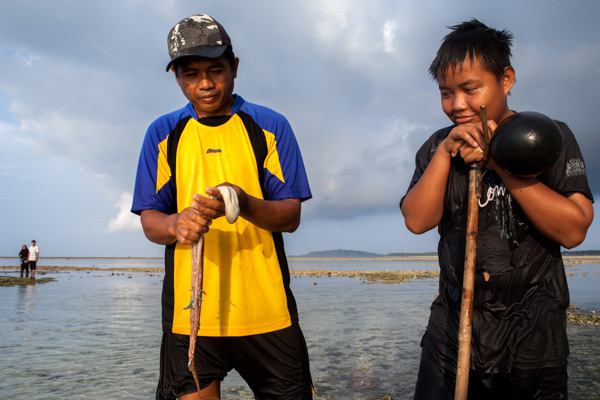 The fish is shared amongst families and often sold in small amounts as a protein substitute for those who can't afford more expensive fish or chicken. 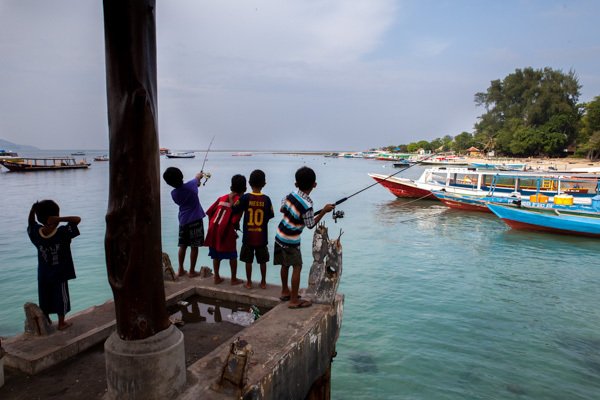 Small local boys fish off the pier at Gili Air's harbor. 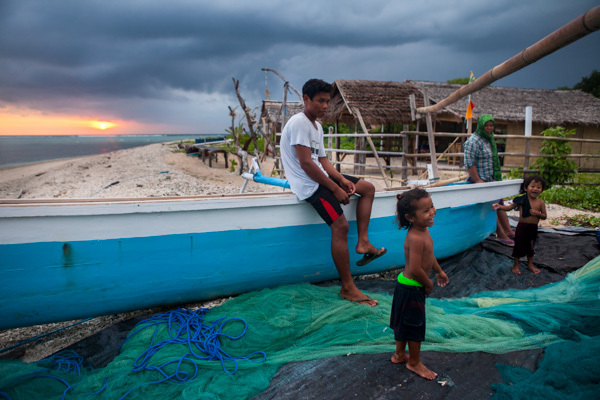 Because the island is so safe, children seem to enjoy a tremendous amount of freedom. 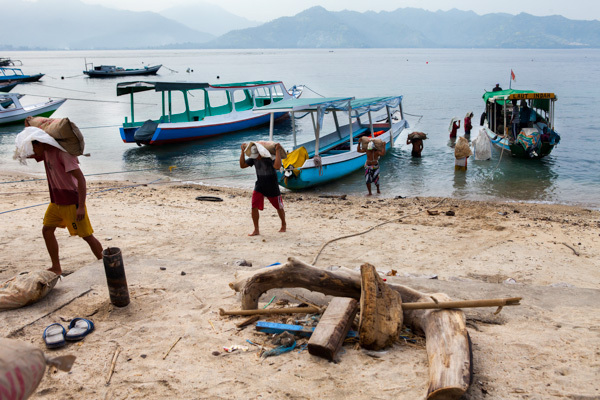 Men unload bags of concrete mix brought over by boat from the neighboring island of Lombok. Most suppplies have to be shipped in from off-island. 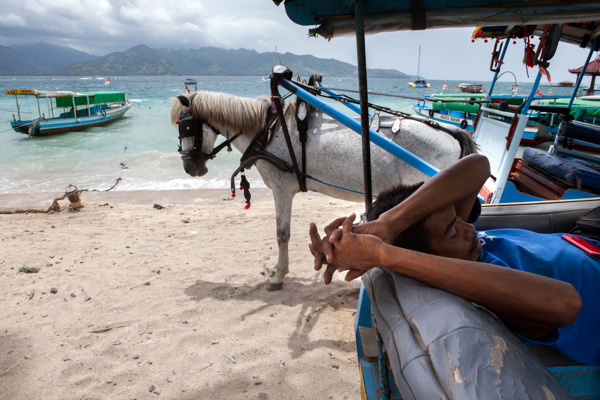 A driver for the local form of transportation--the horse and cart (locally called 'cidomo')--takes a nap while waiting for customers at the harbor. 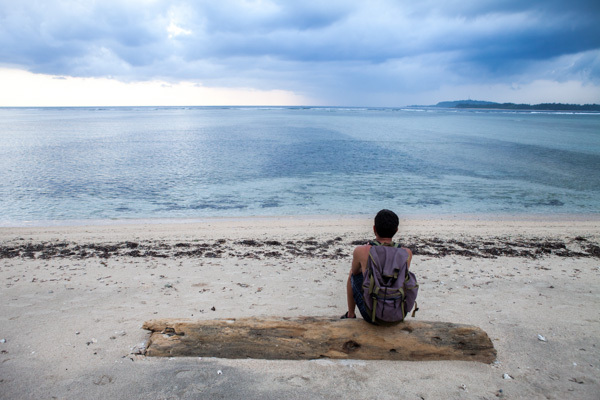 Gili Air is also a place to relax and contemplate life as so many tourists have discovered. On the public ferry leaving the island, so many of of us shared our sadness at having to leave the idyllic environment. 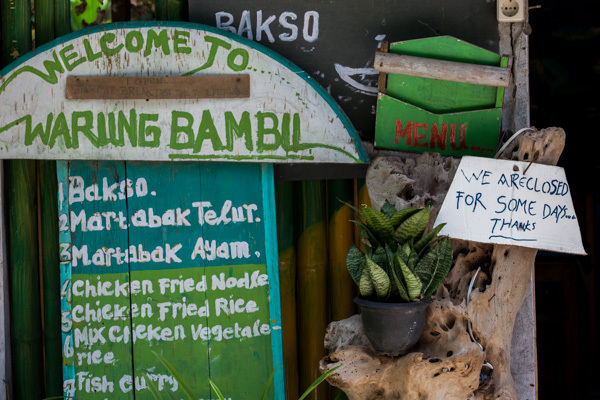 I love this sign, posted on a 'warung' or small family-run restaurant, which I think captures the laid-back feeling of the island. 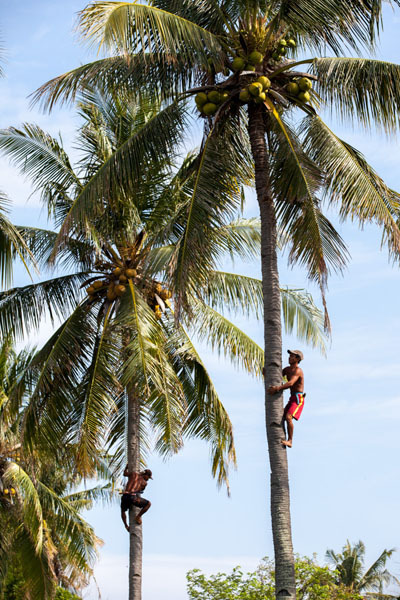 With no harnesses or ropes, men climb coconut palms with machetes tucked into their pants to cut down coconuts. Besides fishing, coconuts are another source of income for local residents. 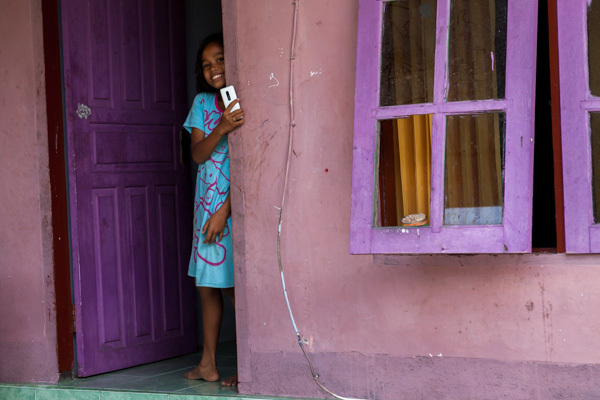 A young girl peeks out of her family's colorfully-painted home. 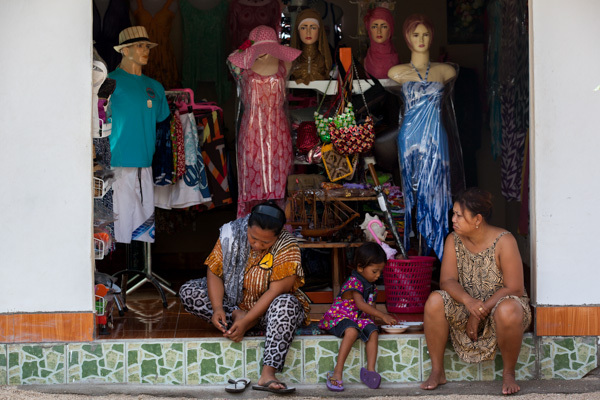 A scene from Gili Air's retail world. 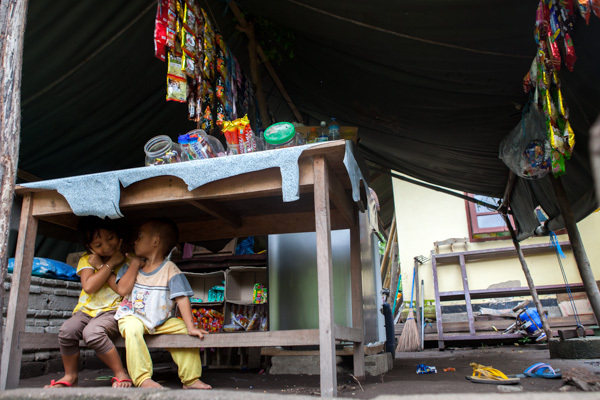 Two children play under the table of their mother's shop which sells just a few items such as candy and chips hanging from the roof. 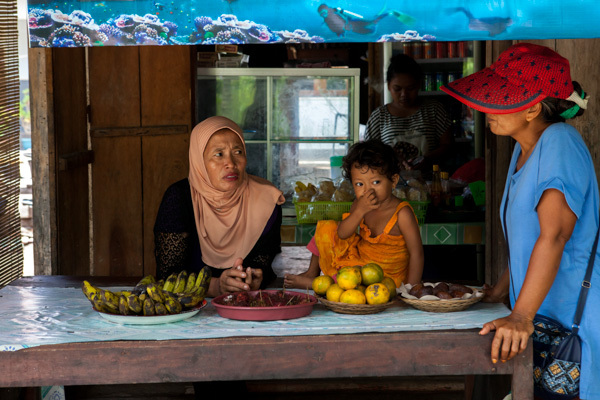 Women chat at the window of a small fruit shop. 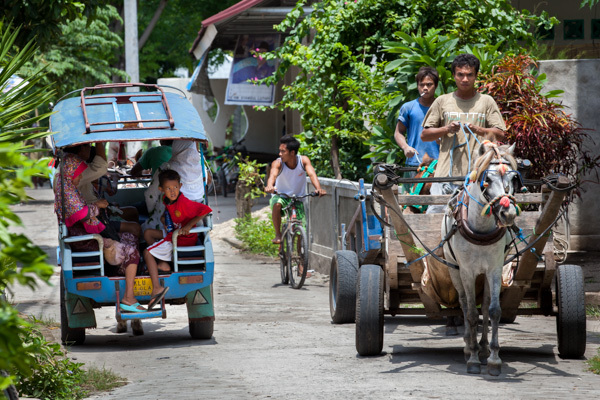 This was the most traffic I saw at one time on Gili Air--two horse carts passing and a bicyclist in the rear! The quietness of a town with no motors is truly an amazing thing. 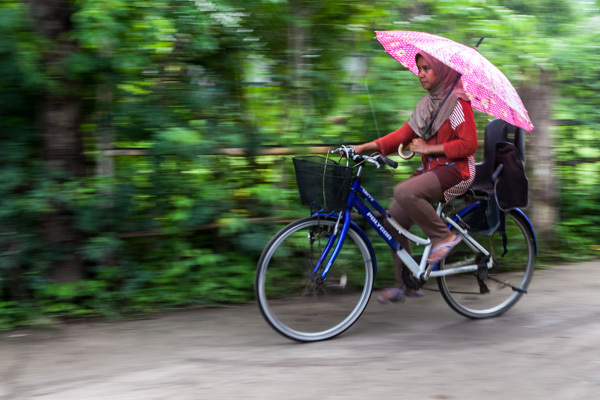 A young woman bicycles during a rainstorm. During the rainy season, afternoon rainstorms are frequent and don't seem to hold life up much. 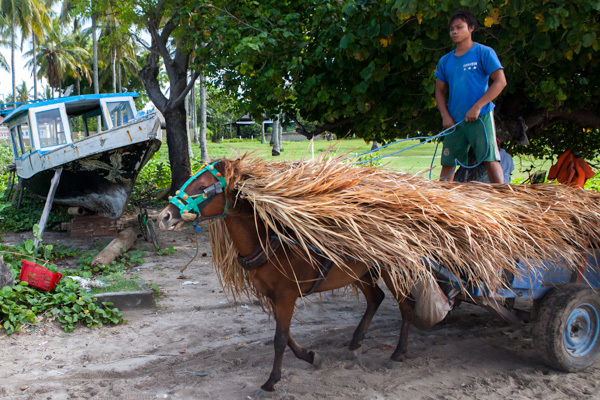 A horse and cart transport hay from one part of the island to another. Kids play soccer in the road. With no cars or motorcycles to worry about, play space extends into areas we normally consider out of bounds. A boy playfully lifts up his younger sister. A young couple hangs out on the Indonesian version of a covered porch. Most homes in Indonesia seem to have this small structure outside which serves as a place to relax, eat, nap or socialize. A young girls walks along a quiet tree-lined path. Gili Air is full of these quiet pathways, which, with no traffic, I experienced as really dreamy and magical. 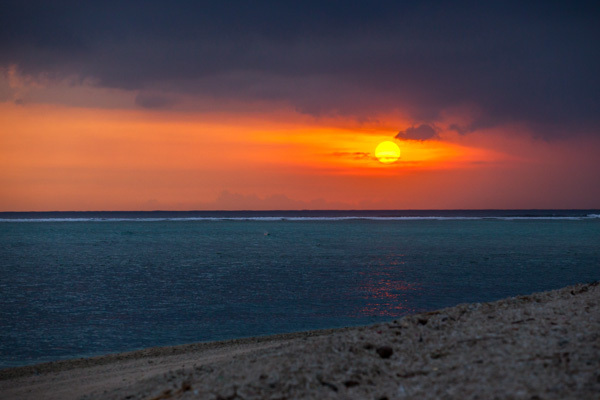 With a storm forming on the horizon, a Gili Air sunset seems particularly dramatic.